Capoeira al-Shababi’s co-Founder and CEO, Lauren Hales, was selected as one of the 21 social entrepreneurs to take part in the RISE for change programme coordinated by UNIDO and Fondazione CRT. “One thing that united the participants was our shared passion for social change and our commitment to being part of that change”, said CEO Lauren Hales. Capoeira al-Shababi conducted two days of training to volunteers working in CRP’s center in Hashemi Shamali, East Amman. When families escape war and resettle in foreign countries, it is not only hard to move forward as a community but also for children and youth to process and heal from the violent experiences they witnessed. 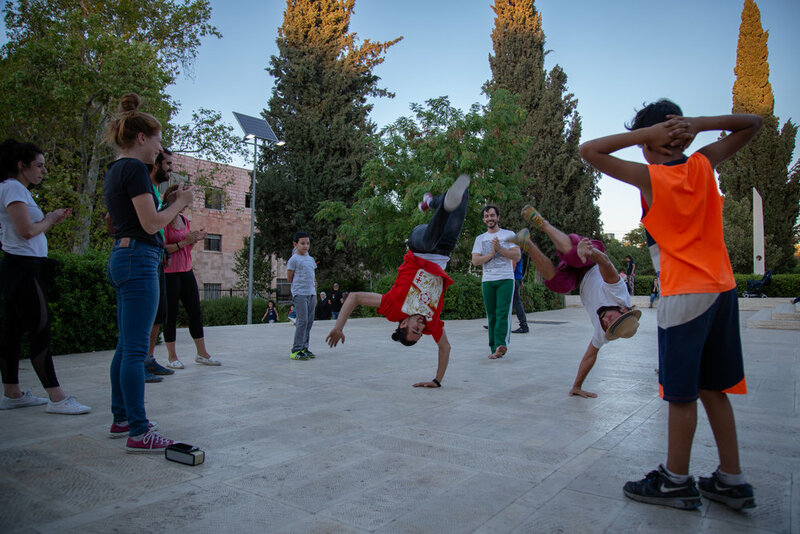 On Wednesday July 18th, Capoeira al-Shababi provided a free and open demonstration of its work in Amman's muntaza public park. The capoeira community showed its support by showing up and joining the trainers in their demonstration of what a capoeira session inside a refugee camp might look like. Taking the public through ice-breakers, partner-work games and stress-relieving activities, children began to join in and make new friends. Passers-by were intrigued by the crowd of people gathering in a circle and playing together, and pamphlets about our projects were distributed. Capoeira was born in the streets and the outdoors. It is inclusive, social and brings communities together. That is why Capoeira al-Shababi decided to provide this session in Amman's public park, in a city lacking outdoor cultural activities that are free and open to all members of society. Between June 11th and 29th, Capoeira al-Shababi raised over $5000 from over 60 donors. We are overwhelmed by the support we have received to keep our projects running in Za'atari refugee camp, Jordan. We are also excited to have graduated into a permanent partner with Global Giving, the largest global crowdfunding community in the world. Thanks to our generous June donors, we now have permanent, life-long access to safe and easy online donations, corporate partnerships, and the tools, training and support to make our work even more effective. As a vetted partner of Global Giving, Capoeira al-Shababi can assure its donors we are a reliable and accountable organisation working to improve the lives and well being of hundreds of children and youth facing displacement, loss and trauma in the Middle East. Thanks to the generosity of Capoeira al-Shababi trainers and The Shala Tree, twice-weekly capoeira classes in Amman are now collecting donations for our projects. These classes will not only help support our project activities with vulnerable youth across Jordan, but also serve to build up a community and culture of Capoeira in Jordan's capital. Bringing together Jordanian's, expats, children and adults, these classes teach the fundamental elements of capoeira; dance, music, singing, dialogue and most importantly, a sense of community. In a city lacking public spaces and green areas, these classes will bring different people together for the simple enjoyment of human connection, for physical expression and joy. The Shala Tree, Abdoun, Amman. St. George's British International School in Rome has shown tremendous support for our work. The combined effort of non-uniform day's and marathon walks by its students managed to raise over 3000 euros so far to support our non-profit providing psychosocial support, empowerment and healing to refugee youth in Jordan. We are honoured to have the generous and continuous support of St. George's students and teachers.